My marketing team tell me no one wants to read my blogs about lifestyle; apparently the most popular blogs are about topics like what sort of relationship evidence will satisfy your average immigration officer if you are trying to get your partner a visa, or how you get jobs without visas and visas without jobs or why time is your enemy. To them I say, fine, I get it, but our work at IMMagine is as much about preparing people for the kind of life they can or will have in New Zealand (or Australia), as it is about getting them here. I also happen to know there are a lot of people that read this that are frankly more interested in the pieces about our lives and values as they are about the visas. So this week is for the greenies! A quick recap – around 15 months ago our family and some very good friends purchased 22 hectares of land around 150km north of Auckland. The land runs north to south like a great big W. Three ridges, we have two small sleepouts and an open air kitchen on the middle one. The slopes on either side are steep and both feature spring (we think) and rain fed streams with two waterfalls. 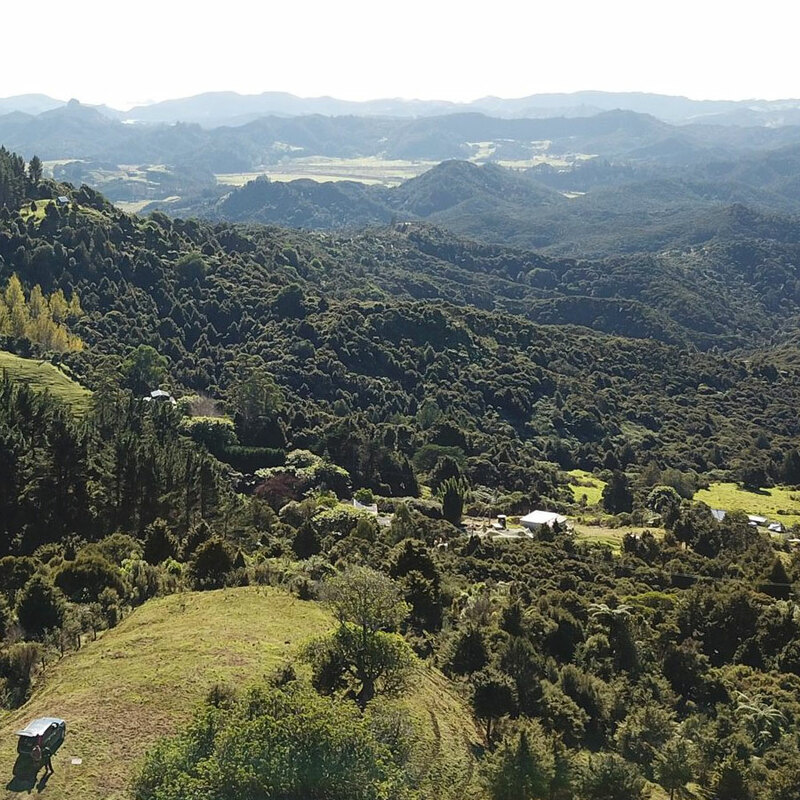 The property is largely regenerating native northland podocarp forest dominated by Kauri, some of which we believe are around 500-600 years old, Kohekohe, Taraire, Tanekaha, Rimu and Miro and a range of native mosses, liverworts, orchid and the like. It is truly a piece of heaven. But it is also damaged goods. Ecologically speaking. Once it would have been home to many species of native birds, including our national emblem and highly endangered Kiwi. This part of Northland’s native forest belt is depressingly quiet with the birds that once thrived here unable to sustain viable breeding populations. Introduced Brush Tailed Possums (fluffy cute marsupials about the size of a cat) from Australia, weasels, stoats and ferrets along with feral cats and the occasional wild pig have led to very quiet forests. They eat everything they can sink their teeth into. New Zealand is trying to rid itself of these introduced predators by 2050 which is no easy task and we wanted to join the effort (and give us a project away from the hustle and bustle of Auckland). There is on average meant to be around 20 possums per hectare and your average Mustelid will eat seven birds a day. Seems then we were home to around 400. We have received some funding support from the Northern Regional Council which means we now have three marked tracks where we put out poison in bait stations for rats along with a number of traps which kill these animals humanly and instantly. The numbers of these pests we have killed has been staggering. The latest body count, as of last weekend, is around 115 possums, around 150 rats, three feral cats and seven stoats and weasels. And most of those have been relatively recent – 20 possums last weekend alone as we have doubled the number of traps set for them. Despite these numbers which boggle my mind, it seems we might have killed perhaps a quarter of the local possum population, hopefully the voracious mustelid population has taken a hit and the rats (which I hate to tell you are often huge) seem to have taken a good beating as well. A couple of weeks ago we had an expert out and she noticed all sorts of native orchids and other flowering and fruiting plants that she explained would not be doing so if we were not getting well on top of the population of possums and rats. Pleasing indeed. More food for the birds and other insects and invertebrates. From our piece of damaged paradise north to the Bay of Islands (around 200km) there are now over 100 groups like ours, all doing their bit on forest and farm blocks of varying size to help make this part of the country at least somewhere where you will see Kiwi in your back garden (at night, they are nocturnal). Right now 95% don’t make it through to their first birthday. An adult Kiwi can fight off a stoat, but a baby has no chance. The visiting expert thought it might not be long before we have Kiwi on our property as it is prime habitat. Time soon to lift and set those traps off the ground where the pests will climb but kiwis, being flightless, will not. I was so looking forward to a long weekend clearing the traps, resetting them, putting out some and rebaiting the bait stations. However, I woke up last Saturday with a bit of a twinge in my lower back and a slightly aching leg. I had told myself before we spent a weekend in the forest the lawns at the beach house needed a mow. I quite enjoy getting out there with the weed-eater, very satisfying work. When I started doing them I had further twinges which led, after an hour, to a lot of lower back pain, resulting in my having to lie down for a bit and the pain getting worse...and not really being able to get up. We had planned Sunday to head over to the forest block to mark a new track on a particularly steep part of the property where, having had a strong pain killer donated by our partners in conservation, I foolishly went. I was tender but I could walk. I was channeling Bear Grylls. ‘You can do it, you have to, or you might not make it out alive’ (to the carpark), etc. I might, if I wanted to make you laugh, tell you about the otherwise normal looking tree I sized up to lean on as I inched my way down a very steep slope, around an hour into the mission. I can spot a rotten tree and this one looked solid as. Mistake. It was in fact completely rotten such that when I leaned upon it, it proceeded to snap in the middle, dissolve into a shower of tiny wood chips and give way, disintegrating utterly. Gravity of course then took over and I, if you believe my wife, gingerly picking her way down the slope behind me, said what she saw was me doing an impersonation of a star fish – legs apart, arms outstretched before in a wild flapping of my fruit salad patterned shirt, disappeared with a crash and a yelp out of sight. All she could hear was what sounded like a barrel rolling through the undergrowth. There was indeed much crashing and shredding of leaves. Down I tumbled. Thankfully this is northland rain forest where plentiful winter rains makes the leaf litter thick, soft and spongy meaning my only real concern as I barreled face pointing down the 80 degree slope, was when I might stop. Which was less than immediate. Eventually I did. Having made like a bob sledder, without the bob sled. I lay there, feeling quite fine, just a little surprised, and yes slightly embarrassed that my inner Bear Grylls, my usually mountain goat like feet and eagle eyes (so ‘at one’ with the forest) had so badly let me down. I could hear shouts from behind me and from up the hill ‘Are you okay?’ and ‘Lie still’ (which I found more than a little ironic given this was a really steep hill, I was lying face down deep in the leaf litter and getting up was the last thing I could do without further risk of plunging deeper into the forest below). I rolled onto my side, swiveled, turned, twisted and sort of bounced (staggered?) up. I felt surprisingly okay (adrenalin surge...) for a 20 meter rainforest tumble. ’Do you feel faint?” ’Sit down! !” demanded my conservation companions. I felt fine but when the ’nurses’ checked me out I realised it hadn’t all been leaf litter and spongy undergrowth - there had been rocks and I had a nice gash in my shin. Which now seems in the process of getting infected. Needless to say I spent the rest of our long weekend of glorious early summer weather prone on the couch or in bed with nothing but Asprin for pain relief (the local pharmacy burned down a couple of weeks ago in mysterious circumstances and the only other one within 25 km was closed for the public holiday). My gait this week has looked remarkably like a cross between a chimpanzee and a 95 year old man. Perfect for the rainforest, looking a lot like one of Jane Goodall’s apes at the Gombe reserve in Africa. I imagine there might be a few possums (also nocturnal) shaken from their slumber thinking there was a magnitude 6.8 earthquake as I tumbled past their nests and if they can giggle, might just have been doing so. Who knows, but ridding this wonderful forest of these critters is worth the pain. Hi Iain, I enjoyed your articles and read all of them. Please tell your marketing team they are wrong. In fact, i'd like the lifestyle more. Continue with the lifestyle comments and posts as they are entertaining and informative. Iain, you are hysterical! Please don’t stop, we love all your writing! Hope your battered body (and ego) mend well! Tell your marketing team to take a wee breather. I love reading all your articles. Hope that you recovered from your tumble. This is everything to me. I'd like the lifestyle .I love adventures.they keep me alive.don't give up the bruises will definitely heal faster than you'd expect. Lifestyle daily life blogs are necessary, seriously. How crap would it be to climb the hill that's the emigration process only to find that there's a desert / rainforest / glacial steppe / <insert any other personally unpleasant environment you'd rather stay home to avoid>, on the other side of that hill. After all were going to live there after jumping through all those hoops. Though marketing is about making the sale, not about how nicely the bike rides after you've bought it. If there's a gel seat as an optional extra then marketing will be sure to mention it, but if the seat is a sliver of PU foam they just won't mention it.